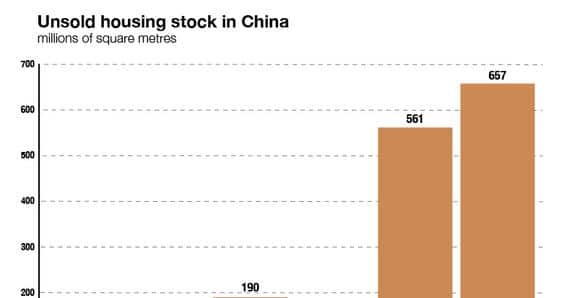 The amount of empty residential space in China is growing fast. Between 2006 and 2010, the stock of unsold housing in the country rose at an annual rate of about 9 per cent, from 123 million square metres to 190 million square metres. Thereafter, there is a three-year gap in official estimates until 2014, when the figure suddenly tripled to 561 million square metres. By the middle of 2015, that total had leapt again, to more than 657 million square metres. The true figure may be closer to one billion square metres, according to Min Zhu, a deputy managing director at the International Monetary Fund (IMF). If that estimate is anything close to accurate, unsold housing in China has increased exponentially over the past decade. Beyond the millions of empty flats that cannot find buyers, there is an oversupply of residential units that are owned but unoccupied. Over 22 per cent of the country’s apartments – more than 49 million units – are vacant. By comparison, India, another rapidly urbanising country that many analysts believe is also facing a housing bubble, has about 12 million unoccupied homes. Even as prices fell in most cities, Chinese contractors broke ground on 20 per cent more housing space in 2014 than was sold. Recent interest rate cuts, and the softening of restrictions on investment purchases, have only slightly eased the plunge in home buying in many markets. China’s ghost cities should not be thought of as cities in the strictest sense, but as largely unoccupied districts on the outskirts of existing urban centres. Many of these formerly rural districts were officially reclassified as urban within the last three decades. Ghost cities can be found throughout the country, but they tend to cluster in the countryside around urban conglomerations such as the Beijing-Tianjin-Hebei area, the Yangtze River Delta near Shanghai and Nanjing, and the Pearl River Delta between Guangzhou, Dongguan and Shenzhen. Walking through one of these empty developments is an impressive, if haunting, experience. They are often entirely devoid of visible economic activity, except for construction crews. Even in relatively small ghost cities, the nearly empty boulevards can stretch on for five kilometres or more. While many vacant districts have managed to fill up in recent years, it is still very much an open question whether most of today’s new developments will become bustling urban centres or abandoned husks. In the worst-case scenario, the cooling trend in China’s housing market will continue or accelerate. These massive developments would remain perpetually underutilised, exerting huge downward pressure on housing prices. Local government debt would snowball as municipalities find themselves unable to sell developers land to pay back infrastructure loans taken when economic growth was faster. The financial repercussions would reverberate throughout the Chinese economy, causing further economic strain and triggering a vicious cycle of loan defaults, declining tax revenue, reduced government spending and falling consumption. There are fears that the social order could even break down in some areas, as squatters seek to occupy vacant buildings in the hardest-hit municipalities. With China’s population set to peak within a decade, and migration from rural areas to big cities already ebbing, the challenge of resolving this housing surplus without a complete collapse of the real-estate market looms large. This gloomy scenario is made more likely by the increasing difficulties generated by China’s urban growth. Ghost cities are the product of generally positive economic and social changes – rapid urbanisation, rising wages and a high savings rate. Fifty-four per cent of China’s population is now classified as urban, up from 26 per cent in 1990. The average wage for these city dwellers more than tripled from 2004 to 2014. China’s fast-growing middle class invested most of its savings in housing. Since residential real-estate prices climbed even faster than wages over the past decade, it was considered a safe and profitable investment. These trends now seem to be reversing. Most factory and service workers are reluctant to buy urban property, even when they can afford it, due to official restrictions enforced by China’s hukou (household registration) system. Under this procedure, state benefits such as education, health care and social security payments are tied to a citizen’s place of birth; changing registration to a new place of residence is difficult. Meanwhile, China’s export-dependent economy is facing competition from nations with significantly lower labour costs, such as Cambodia, Vietnam and Bangladesh. And as the housing market slumps, middle-class investors have reallocated their money to the stock market, inflating share prices. Even after recent declines of as much as 40 per cent, some Chinese stock indexes are still 50 per cent higher than they were a year ago. All of these developments point to serious trouble for China’s remaining ghost cities. At greatest risk are the local governments that have ploughed huge amounts of money into these new developments. The global financial crisis of 2008 prompted the authorities in Beijing to launch a US$585 billion stimulus programme, much of which was funnelled into urban development. Municipalities now face massive solvency problems as the housing market cools, loans come due, and money from the central government dries up. One reason ghost cities remain so prevalent in China is the strong local preference for new housing. Older housing units are sold at a discount. Worries about shoddy construction are widespread, especially in areas prone to earthquakes, flooding and typhoons. Internet users have coined the term ‘tofu construction’ to describe rickety apartments built by unscrupulous developers to make a quick profit. New developments that remain vacant for too long will plummet in value. 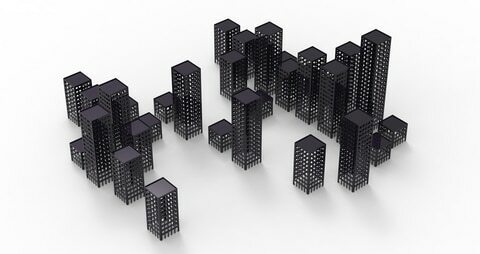 A more optimistic scenario is also possible: many ghost cities could be inhabited and functioning within a few years. This is what has happened in some key economic centres such as the Yangtze and Pearl River deltas, where some previously vacant developments now have occupancy rates above 50 per cent. But this outcome depends largely on a continued flow of migrants into the cities, further wage growth, and – in the longer term – a slight demographic rebound. More than 600 million Chinese still live in the countryside, and a good portion of them could be encouraged to move to the cities with the right economic and policy incentives. Plans to amend the hukou system may improve access to education and health care for migrants from rural areas. The government plans for a 70 per cent urbanisation rate by 2025. That would involve the migration of roughly 200 million more people to cities, or the reclassification of their current locations as urban. Demand for housing, while insufficient to absorb current supply, remains very high in absolute terms. Most urban Chinese see home ownership as a prerequisite for marriage, and China’s severe gender disparity and the resulting competition for available women only reinforces housing demand. Furthermore, most Chinese municipalities do not have property taxes. There is some prospect of a small demographic rebound, or at least a rebalancing. A recent relaxation of the family planning limits applies to couples where either the mother or the father is an only child. This group is composed mainly of the urban middle and upper-middle classes, who have demanding careers and live in areas where housing and education costs are high. Most Chinese couples with official rural household registrations are still limited to two children. If birth restrictions were completely lifted across China, many of these couples might choose to have three. But their successful integration into the urban housing market would still be dependent on the relative affordability of housing, increased economic opportunity and better access to government services. Over the last few years, Western and Chinese analyses of ghost cities have fluctuated between quasi-apocalyptic warnings and dismissals of the very concept. The most probable outcome is that they will remain an acute local problem in many areas, but will not trigger a nationwide financial meltdown and economic downturn. In cities dependent on declining industries such as mining and steel, many ghost cities will stay empty. In urban areas with more diversified economies, new developments should fill up as the real estate market corrects and rising salaries make such housing affordable. Government action will also be needed to defuse the threat posed by China’s apartment surplus. Rural dwellers can only be convinced to move to cities if they are offered the necessary services and can afford housing. Already, steps have been taken to move some universities, government offices and state-owned enterprises into vacant developments to revitalise these districts. In the long run, China’s municipal governments will need a reliable source of income besides land sales. The logical answer is to introduce property taxes. While this would dampen real-estate demand over the next few decades, its effects could be offset by offering home buyers better access to government benefits.